Koh Chuang and koh Chan are two small islands off the coast of Samaesan. They offer good coral dive sites with prolific hard and soft corals and several rocky outcrops. 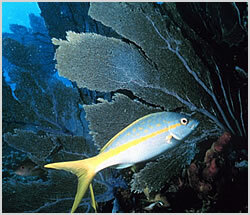 There is a lot of smaller fish life here such as yellowtail jacks and fusiliers. These two spots make a nice change after diving the wrecks.